It used to be humble, and it went unnoticed in a lush garden. 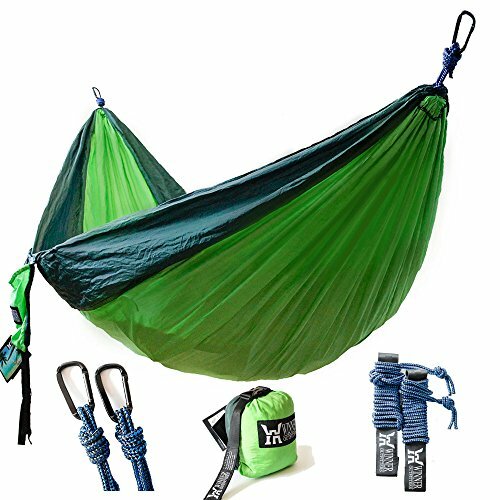 It also used to serve the purpose of supporting plants, but not anymore. Welcome to the world of the decorative garden stakes. 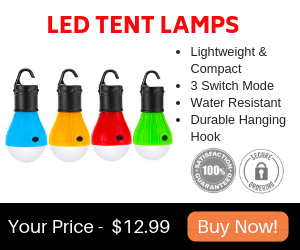 They come in so many variations that it will be difficult to choose just one or a few, so we decided to help you out. Here is out selection of the best and prettiest decorative garden stakes. Every garden needs some sun, right? What would you say if you had your personal one? 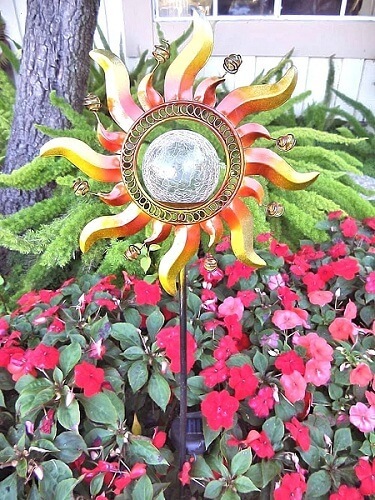 Here is a gorgeous metal decorative garden stake made of copper and shaped like a sun. It reaches 39 inches high after you assemble it, and it comes with tiltable solar panels for capturing sunlight as best as possible. Did we mention that this beautiful copper sun can change colors? Because, thanks to its LED lights, it can. Here’s another decorative stake that can light up your garden at night, thanks to its solar panels. 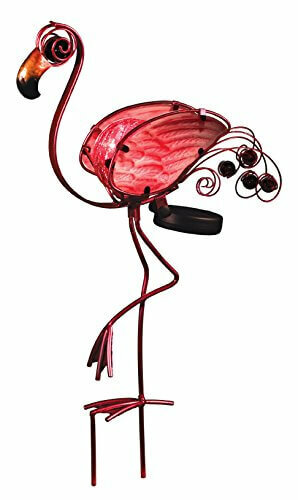 It is made entirely out of metal and pink glass, so that it will stand out from between your garden rows and hedges. It will also withstand any kind of weather, as long as you don’t play croquet with it! 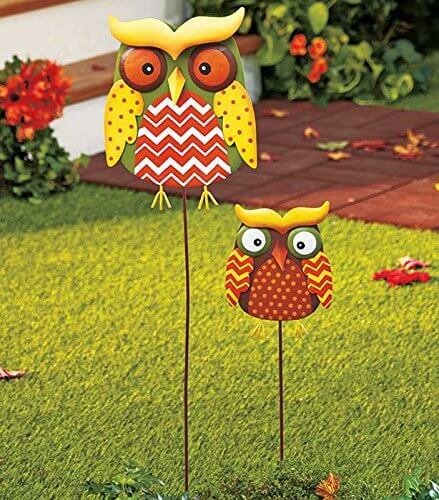 Even though they don’t have LED lights or solar panels, these cute owl decorative stakes are perfect for your autumn harvest décor. They come in sets of two, but you can buy as many as you want. Users that have already purchased them report that the lovely little owls also serve as scarecrows. These items are a perfect example of the fact that decorative garden stakes are not just for your bushes and hedges. You can also use them in pots. Here are some mini versions, with colorful butterflies on top. 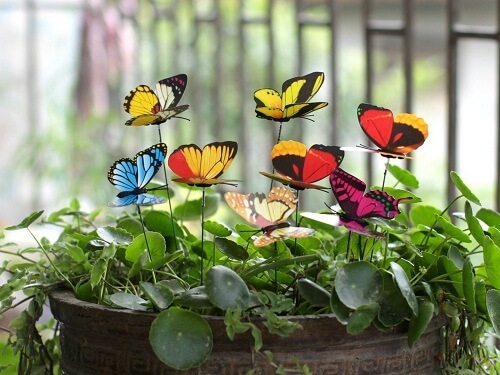 They are so lifelike that they make your flowers look like beautiful butterflies hover over them at all times. 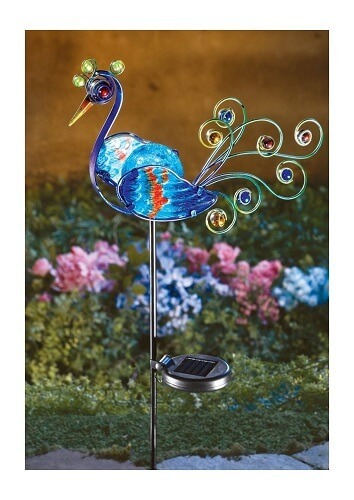 Just like the pink flamingo, the the colorful peacock will be yet another regal addition to your backyard. It’s made out of glass and metal, and it has solar panels which will allow it to soak up as much light as it can during the day and then light up your garden at night for a maximum of eight hours. It has awesome beaded accents that accentuate its slim figure, making it look like a real peacock was strutting around through the hedges. When you go about purchasing decorative garden stakes, it’s crucial that you take a good look at their design. 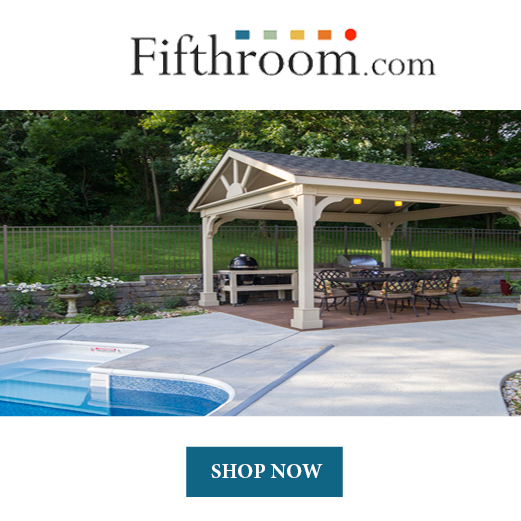 Even so, you cannot possibly go wrong with our top five choices.